Epiphone introduces the new Les Paul Traditional PRO-II™ featuring the ultimate combo of Alnico Classic PRO™ and ProBucker™ humbuckers with coil-splitting for an incredible range of tones. Plus a 15db boost switch along with new color finishes! EXCLUSIVE – Available at selected retailers. 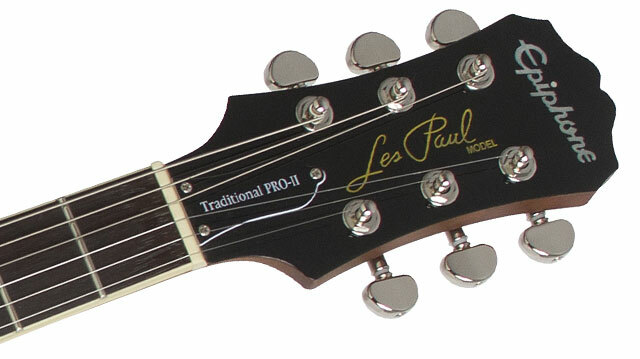 The new Les Paul Traditional PRO-II has the classic build and profile of all Les Pauls with a solid Mahogany body and a traditional carved top. 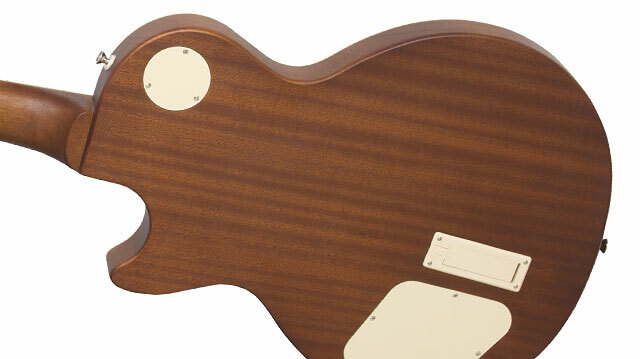 New color finishes include Ebony, Desertburst, Ocean Blue, Vintage Sunburst, and Wine Red. The solid Mahogany neck has a 1960s SlimTaper™ “D” profile with a 24.75” scale and is hand-fitted and glued into the body so the entire guitar resonates as a single piece of wood. A "worn" type finish on the back of the neck and body add to the lived-in feel. The fingerboard has 22 medium jumbo frets, single-ply cream binding, and mother-of-pearl Trapezoid inlays. The Les Paul Traditional PRO-II™ is powered by Epiphone’s most popular humbuckers featuring newly tooled, USA-style bobbins. In the neck position is an Alnico Classic PRO™ with Alnico-II magnets with open zebra coils for a warm, thick vintage tone. 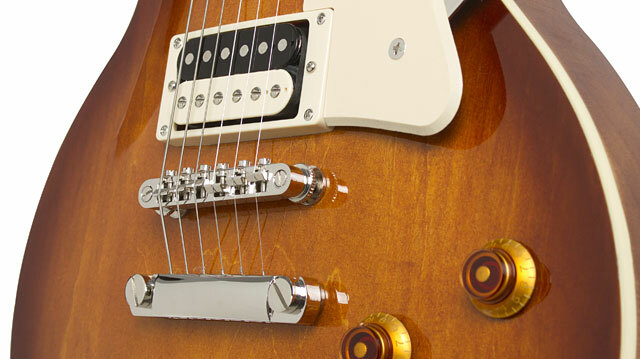 The Alnico Classic PRO™ is paired with an Epiphone ProBucker™-3 at the bridge. The ProBucker™-3 is inspired by Gibson's BurstBucker™-3 and features unevenly wound coils and Alnico-II magnets that replicate the tone of "Patent Applied For" humbuckers found in priceless vintage 50s era Les Pauls. Controls use “TopHat” Volume and Tone knobs which have push/pull potentiometers allowing you to coil-split each pickup for single-coil sounds. 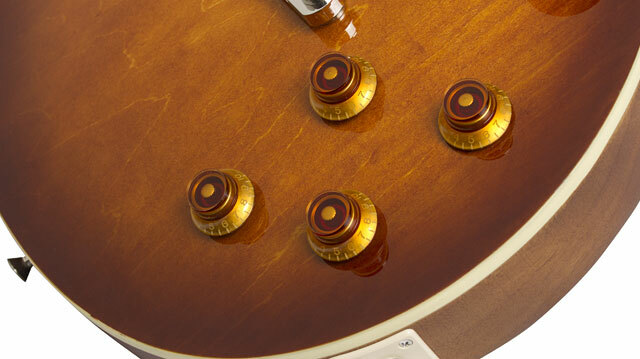 Combined with the 3-way toggle, you can get 6 unique sounds from one great Les Paul guitar! You can also pull up on the bridge pickup’s tone knob for an additional 15db Boost. The active Boost control is powered by a 9-volt battery, which is easily accessible at the back of body. The Les Paul Traditional PRO-II™ comes with legendary Grover® machine heads with an 18:1 tuning ratio, a traditional cream colored pickguard, solid nickel LockTone™ Tune-O-Matic bridge and Stopbar tailpiece, and Epiphone StrapLocks. An optional case is also available. Like all Epiphones, the Les Paul Traditional PRO-II™ comes with a Limited Lifetime Warranty and is backed by world famous 24/7/365 Gibson Customer Service. Visit your nearest Authorized Epiphone Dealer today or visit Epiphone.com to find a dealer close to you anywhere in the world and discover the true sound of rock n’ roll with the new Les Paul Traditional PRO-II.